Ever since the inception of SVYM, many women have consistently and quietly contributed to its growth and progress. Within a week of setting up SVYM, a close friend and classmate, Pushpalatha (now a successful practicing obstetrician in Bangalore) approached me and asked to be part of the movement. Needless to say, SVYM greatly benefited from her contributions, especially in the initial days. Within a few months of joining, she took on the responsibility of the Secretary of the organization and was instrumental in mobilizing many of the lady members. It was she who introduced us to Sumana (who continues to provide legal and other advice to SVYM even today) and her father, the famous socialist and lawyer in Mysore, Mr. TN Nagaraj. The Thumnerale clinic would not have happened but for Pushpalatha and Sumana. When we ran out of funds within the first year of our operation, they singlehandedly brought out our first anniversary souvenir and mobilized the funds that saw us through the next many months. The first anniversary celebrations that we had at Thumnerale is possibly one of the most memorable events that we have had till date. The other two members who I fondly recall whenever I think of our Brahmagiri dispensary are Mridula Nayak (now practicing in the UK and associated with SVYM of UK) and Dechu Ponnappa (now a very famous pediatric nephrologist in the US). Both were still medical students in Mysore and would visit practically every other weekend. We would fondly look forward to their visits as both were keen on ensuring that the food we had was close to being edible. I must confess that their culinary skills definitely did not match upto this intent of theirs! Some of our early lady employees are also people I remember very nostalgically. But for their courage and determination to work under very challenging circumstances, many of our projects would never have seen the light of the day. One of them who is now an inseparable part of SVYM is Beena. She joined us as a young girl and was one of our first employees at the Kenchanahalli hospital. Over the years, she has evolved to become the HR Head of the organization. From completing her graduation to specializing in HR, getting married and becoming a proud mother of a lovely daughter, Beena is possibly the Institutional memory of the organization today. The other person that I would like to remember is Rukmini. Our school at Brahmagiri was in its infancy and running from a cowshed. Rukmini was formally trained as a pre-school teacher and had joined us in 1988. She took on herself the responsibility of teaching the first batch of 28 children. I admired the courage and conviction with which she worked in such a remote place, staying all by herself. Unfortunately, some personal and family issues necessitated that she leave us within that year. 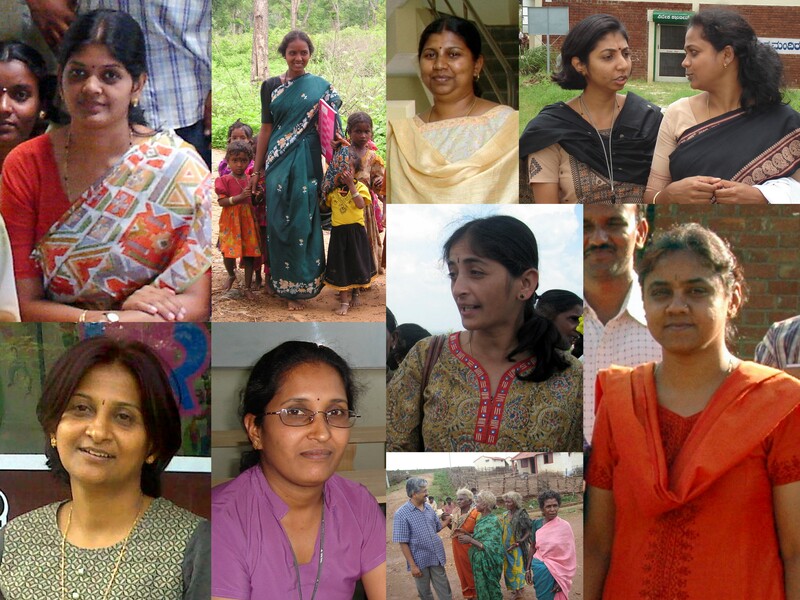 Three other women who helped build and consolidate the health programs of SVYM are Bindu, Sridevi and Padmaja. Bindu and Sridevi were classmates and members of the organization from the medical college days. They were posted to the Kenchanahalli hospital as interns in 1992 and decided that their life’s mission would be to work there. Sridevi who married Seetharam, went on to become a pathologist and returned back to the hospital in 1999. She has also specialized in Bioethics and oversees the medical research activities. I was fortunate that Bindu chose me as her life partner and started working at the Kenchanahalli hospital in December 1993. She later took a break to specialize in Obstetrics and Gynecology and returned in 1998. Apart from being the Chief Medical Officer of the hospital, she also oversaw the Community Care Center at Saragur. Her passion continues to be women’s health issues. As the Secretary, she took a deep interest in Governance issues within SVYM. Dr. MA Balasubramanya married Padmaja, who on completion of her Masters in Obstetrics and Gynecology joined the hospital in July 2001. She is now the Director of our Saragur hospital and is striving hard to make the hospital one of the best in the district. One other person whom we all fondly called ajji (grandmother) was Nagarathnamma. She had retired from the Government health department as a Auxiliary Nurse Midwife (ANM) and joined the Kenchanahalli hospital in the early 90s to be the link between the community and the hospital. What was admirable at her age was the fact that she would trudge long distances to spread the message of community health amongst the tribals. What I can never forget is her failed attempt in trying to get Vivek married to a girl of her choice. Vivek steadfastly continues to remain the elusive bachelor today! While I have already written about the contributions of Mamatha especially to our education team and programs for women, another person who shaped the tribal school at Hosahalli into what it is today is Malathi. Malathi is another extraordinary person whom I admire for her courage of conviction, her passion for child-centric education and clarity of what she wants out of life. Quietly and without much ado, she not only helped enhance the quality of education that our tribal school provided, but also set up the school at Saragur and the Teacher’s Training College at Hosahalli. Today both Mamatha and Malathi serve on the Governing Body of SVYM. For the tribals in Heggadadevanakote, Poshini is synonymous with SVYM and our tribal development work. She is not only the point of first contact for most of them, but is also the elder sister to whom many of our employees go to with their personal issues. Her commitment to the cause of tribal development can only be understood when one interacts with her. She is also one of those who have made empowering people with information her life’s mission and mandate. My respect and admiration for her went up a hundredfold when she walked the entire distance of 420 km when we undertook the Jagruthi Yathre in Sept 2008. She is an authority on the Right to Information (RTI) Act and runs numerous training programs and workshops for community members on using this Act to fight corruption. Activities in Mysore will not be complete without the mention of Sindhu. Qualified as a lawyer, she initially joined SVYM to oversee a women’s empowerment project in 2005 and today is the Deputy Director at the Vivekananda Institute of Indian Studies. Her pleasing personality and meticulous planning has helped create a very welcoming environment to the hundreds of foreign students who come to our Institute to take courses on Indian Studies. Another of my heroines is Bommi. Bommi had lost her husband in 1989 at our Brahmagiri hospital and joined our school immediately thereafter as a helper. She continues to work at the school even today and is our longest-serving tribal employee. Every time I visit Hosahalli, I look for her familiar and smiling face and remember the difficult times she has faced. Having lost two of her children to sickle-cell disease, she continues to labour on and is a mother to both the teachers and students at the school campus. It is just not our own members and employees who are making a difference in the lives of people we serve. There are hundreds of other women from the community who have been with us from the very beginning. I would like to mention two of them here. Madamma, married to Mudalimadiah, the elder chieftain of the Kadukuruba tribe is indeed a real ‘queen mother’. She carries herself majestically, is extremely humble and very conscious of her indigenous roots. Apart from being a pillar of strength in our entire agitation for proper rehabilitation, she also visits the school twice a week to teach our children. She is ensuring that the rich tribal knowledge, customs and culture are carried forward by the next generation. Another person who has been incessantly working to improve the conditions of her fellow tribal women is Bhagyamma. She is one of our women leaders spearheading the ‘Self Help Group’ movement, ensuring that self-help goes beyond mere sloganeering and micro-credit, and leads to real tribal empowerment. Today SVYM has been built on the foundations that so many committed and dedicated women have laid and we can now proudly say that nearly 50% of our organizational human resource are women. These women not only reflect the changing social fabric of our nation, but are a living testimony to the dream that Swami Vivekananda always spoke about. He believed that India can and should only be built on the values and hard work that our women espouse. These courageous and dedicated women are a continuous source of inspiration and serve as models for all of us. Models in the way they balance their family and professional priorities and commitments. SVYM is indeed safe in their hands.